Alexander says that, to honor King's message, we must condemn Israel's actions, before listing all of the usual misleading, if not outright false, allegations against the Jewish state. In sum, Alexander says that it is finally time for people to call out Israel's "egregious abuses" against the Palestinians. One cannot help but marvel at her courage. How refreshing to have someone view this issue with such fresh eyes! To say that we need to have this conversation because no one has done so is absurd to the point of hilarity. Does Alexander not realize that opposing Israel, and consequently supporting the Palestinians, has become the left's great obsession, only rivaled by opposing President Trump? Countless far-left events end up, at some point, portraying the Israelis as the great monsters of our time and the Palestinians as the most oppressed. Alexander may actually be the last progressive to break her silence on this issue. Even more striking is how little Alexander must read the newspaper for which she writes. It seems that nearly every week the Times publishes a story vilifying Israel and glorifying the Palestinians. 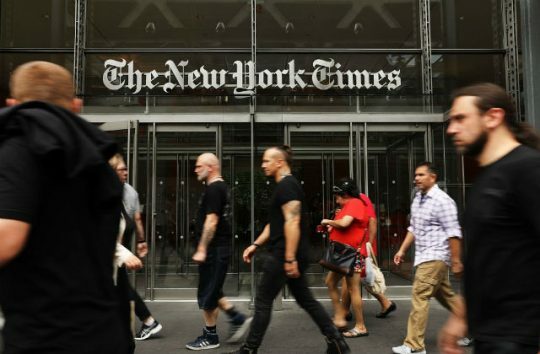 A 2014 study by the Committee for Accuracy in Middle East Reporting in America found that the Times is nearly seven times more likely to publish pieces "primarily critical of Israel than those primarily critical of the Palestinians," and that the paper is "twice as likely to publish opinion pieces that predominantly support the Palestinian narrative about which side deserves more sympathy or criticism than pieces that predominantly support the Israeli narrative." The overall numbers do not always capture the shamefulness of individual articles. To give one example, take the Times‘ 4700-word story, published last month, on the death of a young Gazan medic last summer. The front-page article spans three and a half full pages of the paper and carries the bylines of five Times reporters and credits an additional five Times journalists and a photographer. How many pieces get that kind of treatment? The Times played the part of Palestinian propagandist more than serious journalist. "The shooting appears to have been reckless at best, and possibly a war crime, for which no one has yet been punished," the Times reported, despite the fact that Israel said the killing was unintentional—and despite the fact that the Times described the "improbable" incident in which "the bullet hit the ground in front of the medics, then fragmented, part of it ricocheting upward and piercing [the medic's] chest." The piece—supposedly a straight-news report—also downplayed essential context, describing the large-scale riots in Gaza of Palestinians trying to break the border fence with Israel to kill Jews as "protests." Alexander's op-ed is not profound or original, and it certainly does not deserve to be associated with King. It is simply a sad continuation of a long-standing, virulently anti-Israel movement that flirts with anti-Semitism. In recent years, progressives have adopted this movement, which supports measures to demonize the Jewish state, as their own. "Palestinian rights are being integrated into the broader progressive agenda," Rebecca Vilkomerson, executive director of Jewish Voice for Peace, said last month. "It's becoming almost standard that if you support single-payer health care and climate justice, you'll support Palestinian rights." Michelle Alexander, it seems, is late to the party, but thinks she's helping to make the guest list. This entry was posted in Issues and tagged Israel, Media Bias, New York Times. Bookmark the permalink.